With everything this machine is offering for its price, this is without a doubt one of the best Reebok treadmills, in terms of value, that came out these past few years. Durable and full featured, the Reebok V8.90 treadmill changes the image of Reebok’s earlier models. 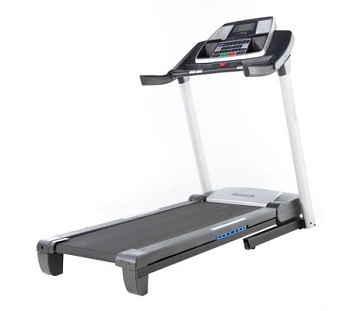 It has become comparable to other treadmills from reputable names of the same price range. If you want a treadmill you can use for light running, then the Reebok 8.9 treadmill is a good option. Although it may cost you more than a thousand bucks, you will definitely find its features and quality worth it. This Reebok is definitely worth checking out if you are in this price range. However, serious runners should avoid this treadmill since it doesn't have a powerful motor. The Reebok V8.90 treadmill is compatible with the iFit® Workout Card Technology, which the manufacturer promises (although I highly doubt it) that you will achieve your weight target in just 8 weeks. Through the iFit Weight Loss Cards, you are provided with a progressive program that will help with your fitness targets. This is ideal for walkers, joggers, and runners. For extra comfort and convenience, the machine is built with a DMX Zone cushioning system that provides extra support to your joints and knees, eliminating any impact that you may encounter. Moreover, the deck provides a wide running surface for additional comfort. The tread belt measures 20 x 55 inches. Add entertainment to your workout. The V8.90 treadmill is built with a port compatible to your iPod or mp3 player. Listen to your favorite tunes and get motivated for every step. Together with the Intermix Acoustics 2.0 sound system, the beat of your songs will get you through your workouts. Meanwhile, get an accurate heart rate reading every time you workout through the dual-grip AccuRate heart rate monitor built in the machine. The wireless sensors are located in the handlebars, so gripping these firmly shall allow them to measure and track your heart rate according to your routine. Other features that you should not miss with this treadmill are the blue-backlit LCD display, 14 Quick calorie-burn workouts, speed and incline QuickStep, and a decent warranty program. The biggest weakness of this treadmill is its motor. The motor offered is only a 2.8HP TRX™ motor. The 2.8HP value is not continuous duty which means this value is the peak power of the machine but won't be able sustain it for a long period of time. This machines continuous duty power is probably around 1.5-2HP only. This simply means the motor is too small to give most people an intense running workout. The Reebok V8.90 treadmill is definitely a good treadmill. However, you should consider the small motor before deciding to buy this machine. If you don't plan to run on it then this machine offers plenty of features and good quality. But if you are a serious runner, avoid this treadmill and just check out other similarly priced treadmills in our best treadmill page. If you plan on buying a Reebok V8.90 Treadmill, I suggest you buy from amazon. They usually sells this for just $1,299.